Buddhism is closely associated with vegetarian eating. However, although Buddhism has been an influential religion in China for centuries, vegetarian restaurant or food products are not that abundantly and overtly available. During the celebration of the 1st anniversary of the China Vegetarian Cooking Association on June 6, 2018,, it was revealed that there were about 4000 vegetarian restaurants in China. This is still relatively low, as the total number of restaurants is estimated to be 5 mln. A fellow student of mine who has been a vegetarian all his life once returned from a visit to China even skinnier than he already was. He claimed that he regularly had problems in China to find genuinely vegetarian dishes in restaurants as Chinese often use small quantities of meat, in particular pork, to flavour food. Another reason could be that vegetables have always played a bigger role in Chinese cuisine than in meat-based European cuisines. But Chinese also believe in a well-balanced meal, so a few vegetable-based dishes need to be complemented with some meat or seafood. Leaving out animal protein altogether does not result in a balanced meal. As a result, most Chinese perceive their cuisine as ‘mainly’ vegetarian. According to an estimate of Xinhua News Agency, there are are now around 50 million vegetarians – about 3.5% of the population. Tang Li, founder and head of the Chinese Vegetarian Association, predicts that in the future, China will become the number one vegetarian country. The association, a non-profit organization that promotes the benefits of a vegetarian diet, was established in 2007, and is made up of ordinary vegetarians, entrepreneurs, activists, and nutritionists. Xiao Changjiang, head of the Cardiovascular Department at the Hunan Academy of Traditional Chinese Medicine Affiliated Hospital, believes that a vegetarian diet is more suited to the Han Chinese than a carnivorous one. “As a farming people, the Chinese had adopted a plant-based diet since ancient times,” Xiao says. “We are less tolerant to meat than nomadic people. Since the 1980s, the massive supply of meat has resulted in people eating much more of it.” In April 2017, Xiao promoted a “one vegetarian meal per week” plan by providing free vegetarian dishes to both patients and hospital staff. “It’s an experience-based activity,” Xiao explains. “We invite the patients to try the meal and then explain the benefits to them. This will make it easier for them to accept.” The scheme has so far served more than 7,000 people, and the feedback has been “pretty good”. November 25 marks the World Vegetarian Day, which is an excellent excuse to have a look at history of vegetarianism in China. Most Chinese people would be familiar with an ancient quotation from their high school textbook: “people who eat meat are shallow minded.” The quote is from the ancient book of Zuo Zhuan, the earliest annals in China. “People who eat meat” refers to the privileged that belong to high class, for only noble people were recorded to have access to eat meat in ancient China for a certain period of time. According to Book of Rites (Li Ji), a historical record written during the Zhou Dynasty (c.11th century-256 BC), the kind of meat people ate was closely related to their social status. Only emperors could eat beef every day. Hereditary rulers and noblemen often had mutton and could enjoy some beef on the first day of each month of the Chinese lunar calendar. Most of the time, the common people only had meat-free meals. However, the book also recorded that the nobles needed to stay away from meat when they were on a fast. When somebody died in the family, they went without meat during mourning. When Buddhism first entered China later in the Han Dynasty (202 BC-220 AD), there were no strict rules about monks’ eating habit. However, emperor Xiao Yan from the Southern Dynasty (420-589) changed everything. He strongly promoted vegetarianism in Buddhist temples by issuing an order to force monks to adopt a vegetarian lifestyle, and abstain from alcohol. Some temples also became well-known for their delicate vegetarian food. In Qing Bai Lei Chao, a book from the Qing Dynasty (1644-1911), four such famous temples were mentioned: Fa Yuan Temple in Beijing, Ding Hui Temple in Zhenjiang, Bai Yun Temple in Shanghai, and Yan Xia Dong in Hangzhou. The Qi Min Yao Shu written in the Southern and Northern Dynasties (420-581), widely recognised as one of the earliest agricultural books in China, recorded 11 vegetarian recipes. The vegetables mentioned in the book included spring onion, leek, wax gourd, mushroom and eggplant. Later vegetarianism became relatively popular in the Tang and Song dynasties (618-1279). According Meng Liang Lu, a book from the Song Dynasty, there were even shops that specialized in vegetarian cakes. The book recorded about 25 kinds of meat-free cakes made from dates and chestnuts. Vegetarian food not only enjoyed more categories, but also more lovely names since the Song Dynasty. There was a kind of cake, named “cakes make cats drunk”, recorded in a book Qing Yi Lu from the Song Dynasty. The cake was made from peppermint and dill, two plants with a strong odour. Vegetarian food gradually become a more delicate choice for ancient Chinese. Li Yu, an aesthetician who was also good at literature, from the Qing Dynasty, praised the vegetarian food as the most valuable delicacy. “In my opinion, beef, mutton and fish are not as good as meat of wild animals. However, the taste of the latter ones cannot compete with vegetables,” Li said in his Xian Qing Ou Ji, a book about his opinions on drama, dance, costume, makeup, architecture and food. Having said that, a typical feature of Chinese vegetarian cuisine is that it aims to perfectly imitate meat. Vegetarian duck looks like duck, tastes like duck and has a texture like duck. 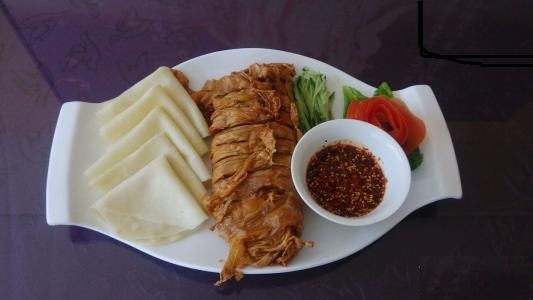 The picture shows an example with beancurd sheet (doupi) to imitate the skin. Chinese people had less eye for vegetarian food during hard years of the republican era and the early decades of the People’s Republic of China, the increase of the living standard of ordinary people increased so much, that they were too happy with the new access to meat, that vegetarian was part of another universe. It was during the post 80s, 90s and even 00s, Chinese consumer interest shifted for subsistence to personal health and body care. On Douban, a popular Chinese social media platform, there are more than 50 groups on vegetarianism. Users discuss the vegetarian lifestyle or share vegetarian recipes in such groups. Many vegetarians also write blogs to share their daily meals with readers, among which, some even publish their own recipes. Benniao and Tudouni, two vegetarians based in Beijing and Chengdu, came to know each other on the internet through sharing vegetarian recipes. They set up a blog, Creative Kitchen of Two Vegetarians, on Sina Blog in 2006. Since then, they have been posting their recipes for vegetarians. In 2008, their first cook book Creative Kitchen of Two Vegetarians was published. The book provides about 200 vegetarian recipes according to the vegetables sold in four seasons. Its sequel about another 180 vegetarian dishes came out in 2010. Xiao Bai, a post-1980s vegetarian cook, attracts 30,000 followers on Douban and around 40,000 followers on Sina Weibo. From 2011, she began sharing on Douban the photos of the meat-free dishes she made. The food was aesthetically featured in the pictures, which soon attracted a lot of attention. One year later, her first cook book, Record of Vegetarian Xiao Bai, was published. Industrially manufactured vegetarian dishes have also become a lucrative market. This picture shows industrially produced vegetarian duck bites. Vegetarian restaurants can now be found in all Chinese major cities. Vegetarian food is also regarded as an exciting option by part of the more well-educated and high-income Chinese city-dwellers. They are embracing plant-based and clean meat as a healthier, more nutritious, and exciting option. In fact, they prefer plant-based and clean meat more than the Americans. According to a study published in Frontiers in Sustainable Food Systems, more Chinese were ‘very or extremely likely’ to buy clean meat when compared to the Americans and Indians. The number of Chinese who were “very or extremely likely” to purchase clean meat was twice as much as the Americans at 59.3% versus 29.8% and 10% more than the Indians. When it came to plant-based food, all three groups expressed a higher rate of acceptance. Yet, the number of Chinese who were ‘very or extremely likely’ to spend on the product was again nearly twice as much as the Americans at 62.4% versus 32.9%, while that of Indians were slightly higher at 62.8%. The best-known restaurant among Chinese vegetarians is the non-profit Yuhuazhai, a loose federation of charities established (according to business legend) in 2011 in Jiande, Zhejiang province, by an elderly restaurateur who invested his life savings to help save animal lives. Volunteers soon followed and opened their own Yuhuazhai restaurants; by 2017, there were nearly 700 kitchens called Yuhuazhai nationwide. With the help of social workers and volunteers, Yuhuazhai has given out over 580 mln free meals without any coordination, economic interest, or real affiliation among all the branches – not even a registered trademark. According to Southern Weekly, the earliest founders of Yuhuazhai discussed the latter issue but decided that it was unlikely that a corporate interest would risk sullying their own image by stealing a charitable icon.